What do we do when we are in heaven? Where do we go when we die? What signs are we given from our deceased loved ones? How are my Grandparents, Parents, Children, Friends, Pets and even extended family members doing in the afterlife? How & Why do ANGELS communicate with us, the living? Are my Grandparents/Parents my Guardian ANGEL? Join internationally renowned Spiritual Messenger and Author, Teresa St. Frances at her event, News From the Afterlife featuring your Family, Friends & Pets. During this magical event Teresa asks audience members to stand up and only give their name. 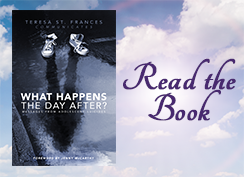 Teresa then communicates with their deceased loved ones and pets to deliver specific factual messages from the afterlife. At the forum Teresa speaks with as many spirits as possible to deliver loving compassionate messages to help people heal. The closure, acceptance and love these messages provide allow for a spectacular evening filled with insightful wisdom and light. As part of the event Teresa’s share her stories, experiences and knowledge about spirituality and the heavenly realms including ANGELS, “T.A.G. TEAM” (Teacher, Angels and Guides). Each event is a unique wondrous experience that will remain with your for a lifetime. Check back frequently for new events and updates, both here and on her Facebook page. Once you have ordered your tickets print a copy of your purchase and that will be your receipt. Bring that receipt with proper ID for admission.